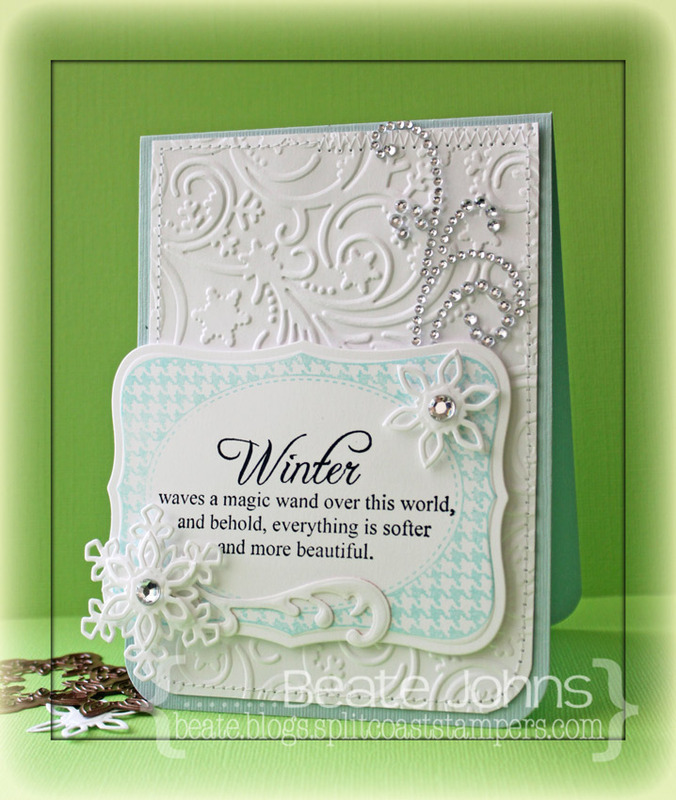 Today’s tutorial on Splitcoaststampers is written by the amazing Eva Doblias. She shows us how easy it is to use Twinkling H2O’s. She couldn’t create a video, so I shot one showing how to use the paints to create a watercolor wash background. 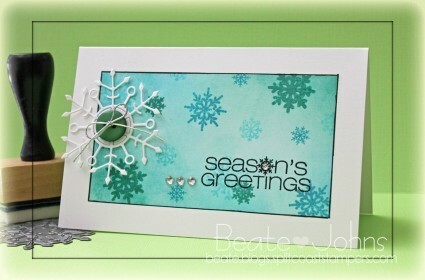 I started by stamping snowflakes from Verve’s Glad Tidings in VersaMark ink on a 3″ x 5″ piece of white cardstock. They were embossed with white embossing powder before I used blue and purple Twinkling H2O’s for the waterwash. Once the paper dried, I stitched the edges of that layer. A piece of white cardstock was cut with the Vintage Oval Frame die and the stamp with the same name was stamped over it with Starlite Black Brilliance Ink. 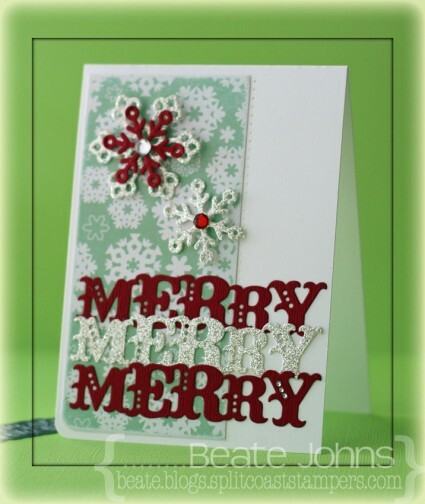 A sentiment from Glad Tidings was stamped in the center. Silver glimmer paper was cut and embossed with the two smallest dies from Spellbinders Create-A-Flake Four, layered on top of each other and connected with a Recollections brad (Michaels). The snowflake was adhered to the right hand side of the sentiment layer. Rhinestones from a Sleek Strips Silver Rhinestone package were added underneath the sentiment. The sentiment layer was adhered to the lower left of the background layer before the background was adhered to the card base. Part of a Finesse Rhinestone Swirl finishes off the card. I created this card a while ago for one of the Hope You Can Cling To challenges on Splitcoaststampers. 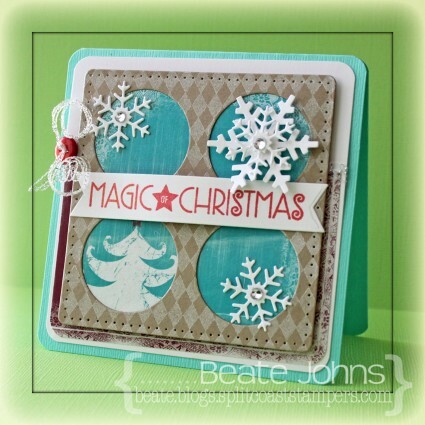 It’s perfect for our new Crafty Friends Challenge, to use a sentiment as the focal point of the card. Are you playing along with us? If not, you’re missing out on the chance to lift the spirits of women battling breast cancer at MD Anderson, and also on more than $6500 in prizes from your favorite crafty companies. So what are you waiting for? Get to stamping! For my card I started by stamping the a frame from Lovely Labels 1 in Sea Breeze VersaMagic Ink on Neenah Solar White cardstock. It was cut out with a Label 18 Nestabilities die. A sentiment from Winter Wonderland was stamped in Jet Black Archival ink in the center of the label. The bottom corners of a 3 3/4″ x 5 1/4″ piece of white cardstock were rounded before it was embossed with the Holiday Magic M-Bossabilities folder and it’s edges were stitched. The layer was adhered to the card base, a 4″ x 11″ piece of Seasalt Canvas Bazzill cardstock, folded in half. The sentiment label was adhered slightly hanging over the right hand side with foam adhesive squares. 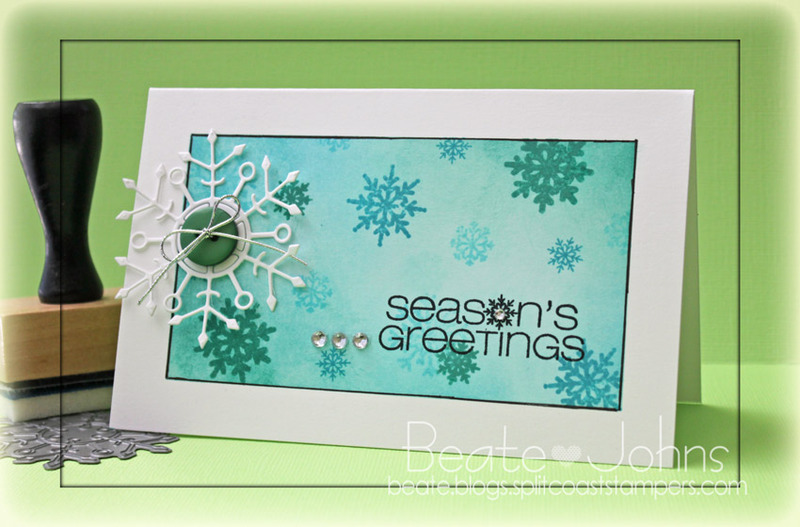 Snowflakes were cut with Create-a-Flake 4 dies out of white cardstock and adhered to the upper left and lower right of the sentiment label. 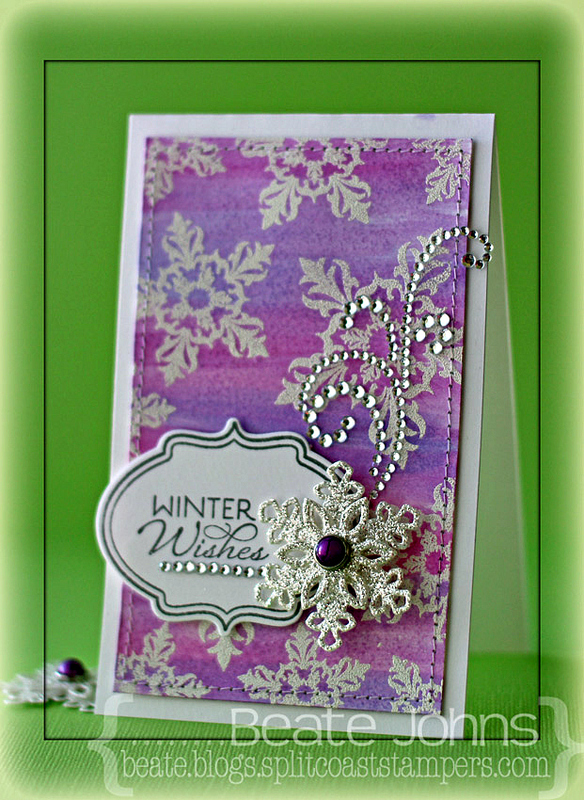 A Flourish out of white cardstock, cut with a the Ornate Artisan Tags and Accents die, was adhered to the right of the double stacked snowflake and rhinestones were added to the center of each snowflake. Part of a Finesse Rhinestone swirl finish off the card. 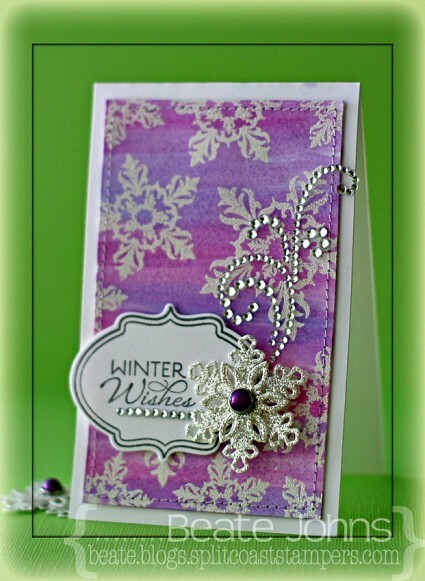 I created this card for last week’s Featured Stamper challenge. 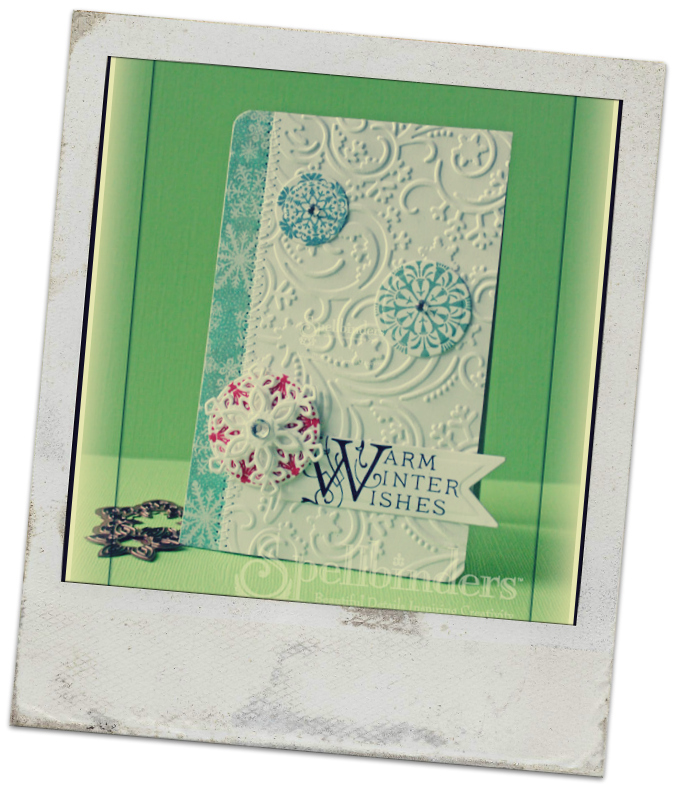 I loved this layout from Cheryl’s card and decided to use it and just change it a tiny bit. I changed the colors, the direction of the stitching and made it a Christmas card. I was too lazy to cut and emboss 9 circles with my Circle Nestabilities, so I used my 1 1/4″ circle punch to cut circles out of Carta Bella’s Merry & Bright patterned paper. They were adhered to the top of a 4 1/8″ x 5 1/4″ piece of Patina Bazzill Cardstock. Two lines were scored at the 4 1/8″ and 4 3/8″ with my Scor-Buddy. Lines were stitched diagonally through the circles and the bottom corners were rounded. A sentiment from Taylored Expressions Very Merry stamp set was stamped on the bottom right corner of the cardstock with Jet Black Archival ink. 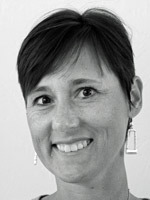 The layer was adhered to the card base, a 4 1/4″ x 11″ piece of Neenah Solar White cardstock, folded in half. White cardstock was cut and embossed with two small Create a Flake 4 Spellbinders dies. They were adhered together with more foam adhesive square. A rhinestone was added to the center of the flake. It was adhered to the lower left circle. More rhinestones from a Sleek Strips Silver Rhinestones were adhered in the center of each circle and to the left of the sentiment to finish off the card.